According to published research and anecdotal evidence, the aging surgeon remains a problem throughout hospitals and medical centers across the United States. Some studies have shown that patient mortality rates are higher for surgical procedures performed by older surgeons. However, other analyses have suggested that surgeon age is a relatively weak predictor of operative mortality in aggregate and should be taken into context when evaluating performance among individual surgeons. Several arguments have been made to support the case against mandatory retirement for surgeons based on age, including the Age Discrimination in Employment Act of 1967, which outlawed forced retirement based on age. In addition, studies suggest that age alone is not a sufficient predictor of cognitive performance. There may also be treatable causes of poor performance among surgeons. Furthermore, there is a tendency in society toward ageism. 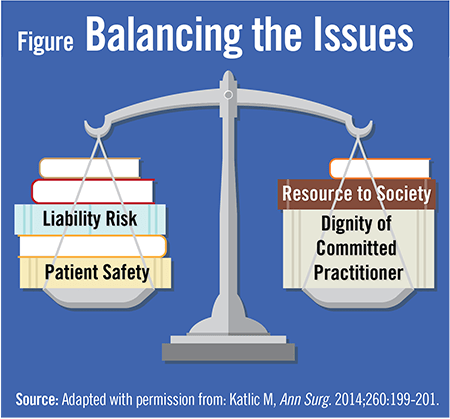 According to Dr. Katlic, it is critically important to balance patient safety and liability risk while respecting the dignity of committed surgeons and their value to society (Figure). “The public believes that we police ourselves, but this isn’t necessarily the case,” Dr. Katlic says. “Although initial certification to being a surgeon is difficult, recertification is relatively easy. In some states, it’s more difficult for older people to keep their driver’s licenses when they reach the age of 70 than it is for similarly-aged surgeons to continue practicing.” Compounding the issue is that many senior surgeons have been teachers and mentors of younger colleagues, some of whom may become enablers by assigning others to assist them with their procedures. “It often takes a patient death to force action, but we need to make efforts to prevent these events before they occur,” says Dr. Katlic. In an effort to address the issues surrounding aging surgeons, Dr. Katlic and colleagues at Sinai Hospital of Baltimore developed the Aging Surgeon Program. 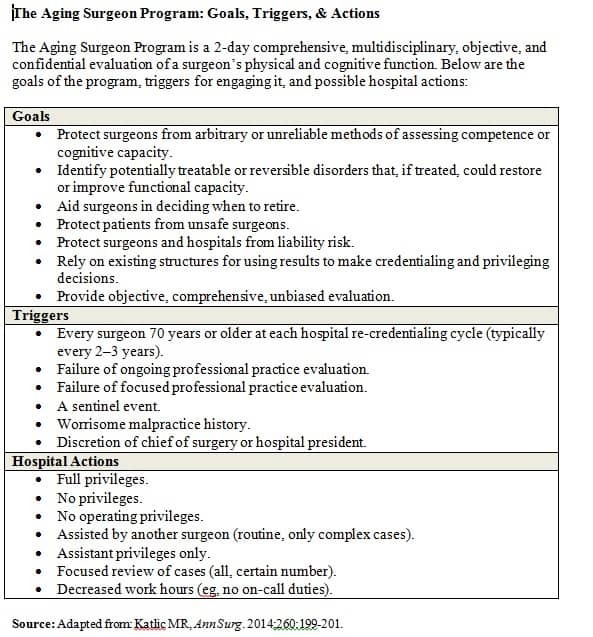 The program consists of a 2-day evaluation that is comprehensive, multidisciplinary, objective, and confidential and assesses surgeons’ physical and cognitive function (Table). There are several different triggers for the program, including every surgeon aged 70 or older at each hospital re-credentialing cycle, failure of ongoing professional practice evaluations, a sentinel event, or a worrisome malpractice history, among other reasons. There is also a wide array of possible hospital actions, ranging from full privileges to no privileges and other types of privileges in between. The Aging Surgeon Program includes a pre-visit screen of medical history and appropriate recent radiographs (eg, MRI). On the first day, general physical and neurologic examinations occur in the morning followed by neuropsychology testing in the afternoon. The second day encompasses a morning of neuropsychology followed by physical and occupational therapy and ophthalmology, and then concludes with an exit interview. The resulting report is sent confidentially to the person who contracted and paid for the program. Reports include only objective findings. Decisions about privileges, retirement, or lifestyle changes must be made by those who receiving the report. Katlic MR, Coleman J. The aging surgeon. Ann Surg. 2014;260:199-201. Available at: http://journals.lww.com/annalsofsurgery/Citation/2014/08000/The_Aging_Surgeon.1.aspx or at: http://www.medscape.com/viewarticle/829600. Neumayer LA, Gawande AA, Wang J, et al. Proficiency of surgeons in inguinal hernia repair: effect of experience and age. Ann Surg. 2005;242:344–348; discussion 348–352. Waljee JF, Greenfield LJ, Dimick JB, et al. Surgeon age and operative mortality in the United States. Ann Surg. 2006;244:353–362. Lee HJ, Drag LL, Bieliauskas LA, et al. Results from the cognitive changes and retirement among senior surgeons self-report survey. J Am Coll Surg. 2009;209:668.e2–671.e2. Bieliauskas LA, Langenecker S, Graver C, et al. Cognitive changes and retirement among senior surgeons (CCRASS): results from the CCRASS Study. J Am Coll Surg. 2008;207:69–78; discussion 78–79. Drag LL, Bieliauskas LA, Langenecker SA, et al. Cognitive functioning, retirement status, and age: results from the Cognitive Changes and Retirement among Senior Surgeons study. J Am Coll Surg. 2010;211:303–307. PreviousHypertension Trends in the U.S.
Mark R. Katlic, MD, MMM, FACS, has indicated to Physician’s Weekly that he has or has had no financial interests to report.